Hanoi (VNA) - A visiting delegation from the Communist Party of India (CPI) was received by Politburo member, Secretary of the Party Central Committee and head of the Party Central Committee’s Mass Mobilisation Commission Truong Thi Mai in Hanoi on July 6. 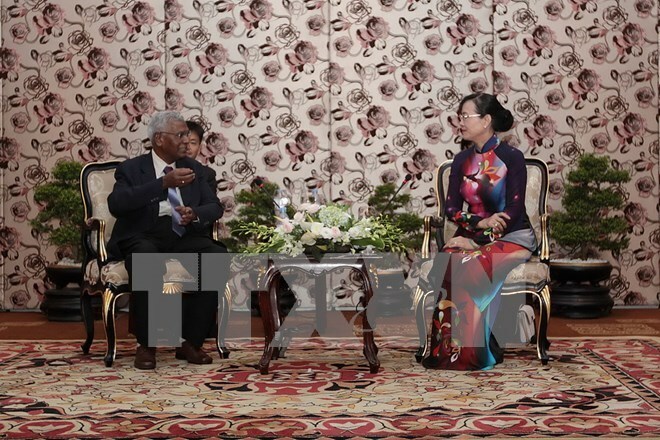 Mai affirmed that the Party, the Government and the people of Vietnam always treasure the friendship with the CPI and bear in mind the support the CPI and the Indian people have provided for Vietnam in the struggle for the nation liberation in the past as well as the current nation’s protection and building. She also expressed thanks for the support the CPI has provided for Vietnam in international and regional issues, particularly in the East Sea – related matters. The Communist Party of Vietnam (CPV) always wishes to promote the friendship and solidarity between the two communist parties as well as the cooperative relations between Vietnam and India for the benefit of the two peoples, as well as for peace, stability, cooperation and development in the region and in the world, Mai reaffirmed. For his part, head of the CPI delegation Doraisamy Raja expressed his admiration for the significant achievements Vietnam has made in socio-economic development over the past years amid the world’s challenges. The CPI Politburo member said his party always wishes to foster the relations with the CPV, particularly in information and experience exchange in building the party, thus contributing to boosting the cooperative ties between the two nations. He also reiterated the CPI’s stance of supporting the peaceful settlement of disputes in the East Sea in line with international law, including the 1982 UN Convention on the Law of the Sea (UNCLOS) 1982 and the Conduct of Parties in the East Sea (DOC) and towards a Code of Conduct in the East Sea (COC). The same day, the Indian delegation had talks with a CPV delegation led by head of the Party Central Committee’s Commission for External Relations Hoang Binh Quan. The two sides discussed socio-economic development in their respective countries and international and regional issues of common interest, as well as concrete measures to forge the bilateral relations.